In a church in the centre of Leicester, there’s a beautiful and rather unusual stained glass window. It’s a depiction of The Last Supper featuring Jesus and the Disciples. Except it seems to show that one of the disciples is a woman. The disciple concerned is the only one in the portrait that isn’t heavily bearded. Not only that, the figure – to Jesus’ left – is draped over Him, partly covered by His robe and arm, and is clearly showing great affection towards Him. The window is behind the altar at St Mary de Castro Church, one of the oldest churches in Leicester. It’s not actually an old window though – it was created by the 19th century artist William Wailes, proprietor at the time of one of England’s largest and most prolific stained glass workshops. Could it be that Wailes was buying into the persistent minority theory that one of Jesus’ disciples was actually a woman – Mary Magdelene – the same theory propagated by the best-selling book The Da Vinci Code? And if he was, why should he be pursuing this highly controversial theory in the St Mary de Castro church? This is, to be frank, a speculative article, but we think we have an answer. 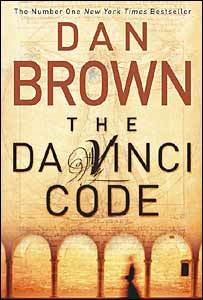 The Da Vinci Code, the controversial religious thriller by Dan Brown, is one of the best-selling books of all time. It’s based on the seemingly wild idea that Jesus Christ married Mary Magdalene, who was pregnant at the time of the crucifixion – and therefore Christ has descendants. It’s an idea that has had a small cult following for hundreds of years, according to the author. In 2006, the book was adapted into a blockbuster film starring Hollywood legend Tom Hanks. If you have seen the film, you may know that Leicestershire’s link to the movie is Belvoir Castle – a location where various scenes in the movie were shot. But there could be a much stronger link. If you research the history of Leicestershire, you find there could also be a local connection to the underlying themes of The Da Vinci Code. 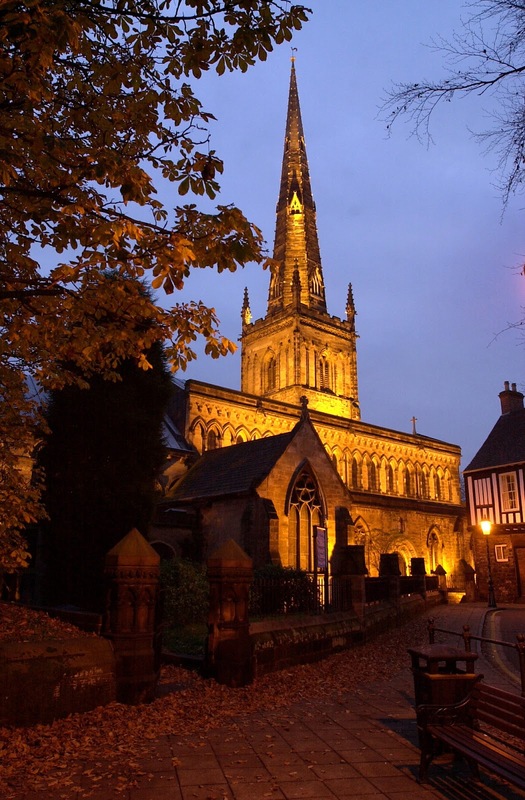 As we delve into the depths of Leicestershire history, to a time when Leicester was ruled by powerful Norman lords, we see that the Dan Brown’s “holy bloodline” may have flowed through the heart of Leicester. Dan Brown’s book is a fantastic work of fiction, based on highly controversial theories, put forward most recently by Michael Baigent, Richard Leigh and Henry Lincoln in the bestseller, Holy Blood, Holy Grail. They claim that the pregnant Mary Magdalene travelled in a rudderless boat to Southern France. The boat, they say, carried The Holy Grail – which was Mary Magdalene herself, because she was the vessel that carried the blood of Christ in the form of her unborn child. When older, the theory goes, Mary’s divine child would eventually intermarry with noble families to create a truly royal French bloodline known as the Merovingian dynasty. It is claimed that the Merovingian bloodline was protected by the Order of the Knights Templar. On its release, Holy Blood, Holy Grail became an instant bestseller. But mainstream historians, academics and the Church gave a universally negative response. The Merovingians themselves certainly existed though. They were a historical family who ruled France for hundreds of years. Like many royal families at this time, they claimed their authority was given by God. Ancient kings claiming they were “related” to Jesus is not uncommon. The Merovingian dynasty followed this tradition and throughout their reign, they claimed that they were indeed the descendants of Jesus and his wife Mary Magdalene. By doing this, their status and their authority could never be questioned. This, of course, should be taken with a pinch of salt, for there is no evidence of any kind of divine union. But there is a certain mystique that surrounds the Merovingian kings, such as their legendary attributions of saintliness, wisdom, magical powers and they openly promoted their “divine origin”. So what does all this have to do with Leicester? Quite a lot, as it turns out. After the Norman Conquest of 1066, Leicester was ruled by powerful Norman Earls – the families of de Beaumont and de Montfort. Both families are in fact direct descendants of the ancient Merovingian line of kings. 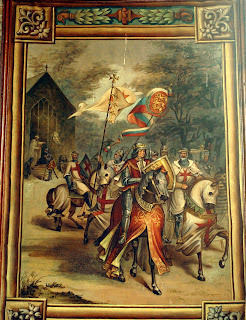 The royal bloodline entered Leicester through Leicester’s first Earl, Robert de Beaumont, and particularly his wife Isobel de Crepi of Vermandois. 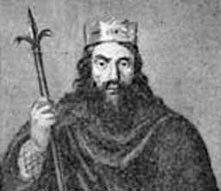 Their child, Robert le Bossu was the first true Merovingian ruler of Leicester. As he was a boy when his father died, Robert was brought up at court under the protection of Henry I. History notes that as a boy, le Bossu was “remarkable for his learning and piety”. 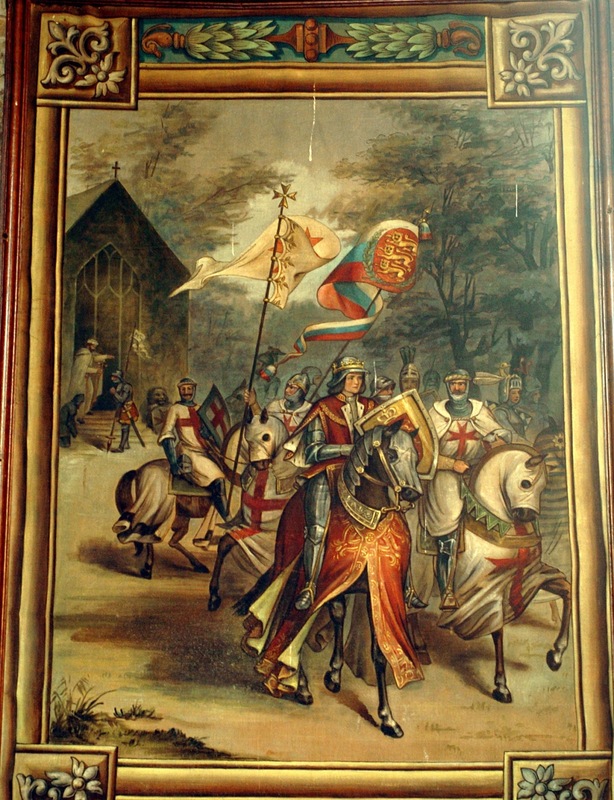 He took an active part in the civil wars that followed the death of the king and, under the victor’s son, Henry Plantagenet, he rose to the highest offices in the state. Le Bossu’s brilliance was observed by King Henry II, who made him his friend and adviser. Robert le Bossu was succeeded by his son Robert, called Blanchesmains. The Merovingian line, always strongly linked to Leicester, only finally died out when the great Simon de Montfort was killed in battle in 1265. So within Norman England, Leicester was a Merovingian stronghold, with its own local rulers – and its own rules. The Norman Earls who controlled Leicester were at one time either directly controlling the country or advising the king. Leicester’s rulers, from Robert le Bossu through to Simon de Montfort were in a league and class of their own. They were all great thinkers and powerful men, learned in many disciplines. One thing is for certain, like the Merovingian kings who came before them, the Earls of Leicester had the same brilliant attributes and talents, which only adds further mystique to the Merovingian bloodline. They may have followed their ancestors in terms of wisdom, but did the Earls of Leicester promote the myth of their divine origin? It’s certainly possible. 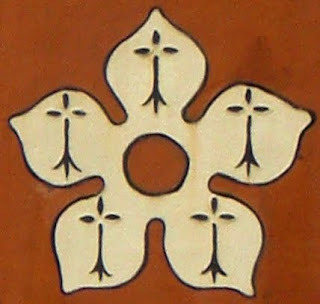 The seal of the last de Beaumont Earl, Robert FitzPernel, and used as a badge by all the Earl’s before, is the cinquefoil – also the present day symbol of Leicester City Council. If we look into history, the cinquefoil is a five-petalled rose commonly found in Christian symbolism of the Middle Ages. It is called the “Rose of Venus”, because its five points mimic the pentagrammatic path of Venus in the night sky through the year. It was also a symbol associated with Mary Magdalene during the Middle Ages. Could the Merovingian Earls of Leicester have encoded their family’s belief that they were descended from Mary Magdalene in their seal? Is the symbol of Leicester not only a symbol of the Merovingian Earls, but also a symbol of Mary Magdalene? Which brings us to St Mary de Castro church. 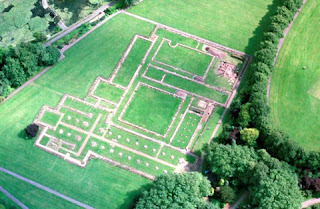 Along with the St Mary de Pratis abbey, it was one of the most important religious buildings in Norman Leicester. St Mary de Castro was built by Robert de Beaumont, and largely rebuilt by his son, Robert le Bossu. Le Bossu also built and richly endowed the magnificent St Mary de Pratis abbey, the ruins of which can be seen on Abbey Park. The primary building of the abbey is built in the shape of a cross and if you draw a line through its long axis, and extend it eastwards for approximately three miles, it lines up directly with St Mary’s church in Humberstone, also built by order of Robert le Bossu. These churches are all believed to be dedicated to the Virgin Mary, mother of Jesus. But some scholars now claim that many Norman churches dedicated to St Mary (particularly those built by Merovingians) were originally dedicated to Mary Magdalene. It is certainly possible that the Merovingian Earls encoded their family secrets into the name and symbolism of their religious buildings. Interestingly St Mary de Castro is always translated as St Mary of the Castle. But any Latin dictionary will tell you that Castro also means “unmanned” or “emasculated” as in castrated. In The Da Vinci Code, Dan Brown uses Leonardo da Vinci’s masterpiece, The Last Supper, as evidence that one of the disciples was a woman. The painting seems to show a feminine figure seated next to Jesus. The theory is that this “woman” is Mary Magdalene. Many believe that Da Vinci bought in to the theory of the female disciple. The point is that there is a history to putting a female-like figure in a Last Supper picture. The St Mary de Castro Last Supper is behind the altar of the church. 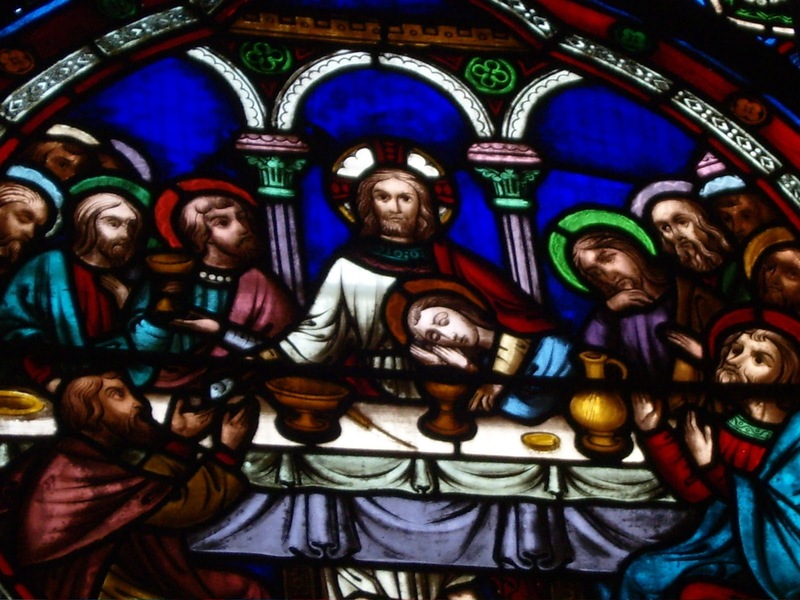 The image is intricately created on stained glass and shows Jesus sitting at a table with his 12 disciples. The figure on Jesus’ left does appear to be rather feminine. 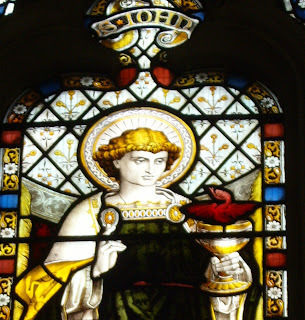 Are we to believe the official interpretation: that this is St John? There is also a stained glass window dedicated to St John in Leicester Cathedral. This depiction again looks rather feminine, being the only biblical figure in the collection without a beard and strangely enough, holding the Holy Grail. A red dragon is seen coming out of the Grail, which some believe is also a symbol of the bloodline. There is a growing body of thought that St John was a cover for Mary Magdalene and there are some scholars who believe the author of the fourth gospel of the Bible is indeed Mary Magdalene herself. It doesn’t matter if you think all this Mary Magdalene theory is nonsense. Most people do. What matters is what the people who built St Mary de Castro believed, and whether those beliefs have been referred to by subsequent designers. Some historians claim that the Knights Templar were formed to be the protectors of the Merovingian bloodline. If so, then surely they would have had a presence in Leicestershire? It appears that they did, at Rothley Chapel, today located within the domain of the Rothley Court Hotel. The chapel was home to the Knights Templar for over a hundred years, during the Earldoms of Robert FitzPernal and Simon de Montfort. The Templars were extremely powerful players in England and across Europe, and were known to have shown particular respect to Mary Magdalene. Records show that by 1203, local nobility had given them great swathes of prime Leicestershire farming land. They were rich and extremely influential but there is severe lack of events recorded regarding Leicester’s Templars. Maybe there was nothing to record, but as the order was a secret one, and as they held meetings that were not open to the public, we would never know their exact motives and activities. Nevertheless, the Order of the Knights Templar were here during our very own Merovingian era. So the early Earls of Leicester were French aristocrats known as Merovingians, who believed they were descended from Jesus and Mary Magdelene. 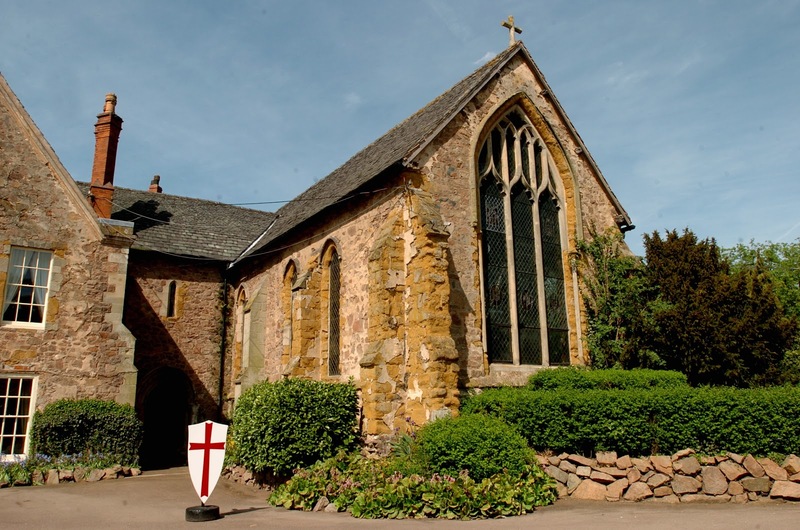 The Knights Templar may have been the guardians of the Holy Grail, and may have been in Leicestershire to look out for our Earls of “divine” origin. The Merovingian Earls could well have subtly encoded this “divine” myth into their symbolism and their churches. The symbol of Leicester, taken from the Merovingian Earls, could be a symbol of Mary Magdelene. And maybe the proprietor of a 19th century stained glass workshop knew of the Magdelene myth, and built a window depicting it in St Mary de Castro church, a church that was largely built by Leicester’s Merovingian Earls. i use to be a choirboy at st Mary de castro church back in the late 60s to early 70s rang the bells, we did weddings a lot of good childhood memorys .